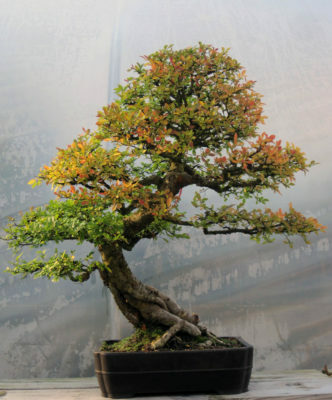 With a focus on care and maintenance, learn all the basics of bonsai design. 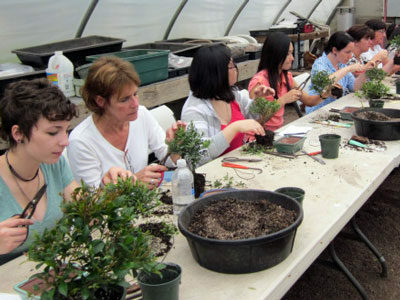 Select a tree, learn how to prune, transplant, landscape with rocks, and discover what the art of bonsai is all about as you create your very own bonsai to take home. This class includes everything you need! Make trees part of your relationship. One registration is for two people. 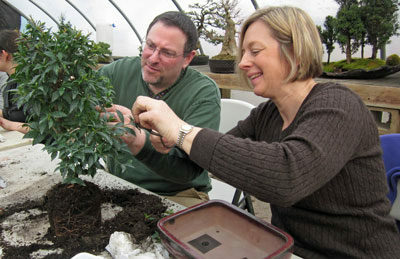 Bring Your Own Bonsai and learn how to develop it through the seasons and over the years. The Workshop is limited to only 6 students per session. 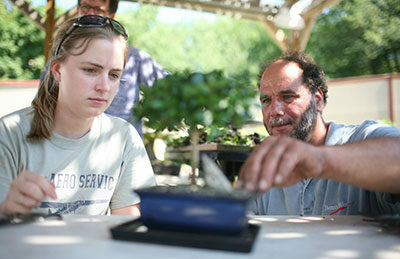 Students learn at their own pace, according to what their bonsai needs. Through personalized instruction and expert guidance, students will climb the next step in making beautiful healthy bonsai. 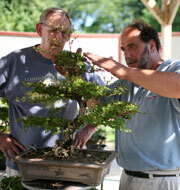 Prerequsite of one or more of our Introduction to Bonsai Classes. This is a full day. Bring-your-own-tree Masterclass. We are limiting the class size to 10 to allow each person to have as much time with Mauro as possible. Bring your favorite or most difficult trees. Materials NOT provided. 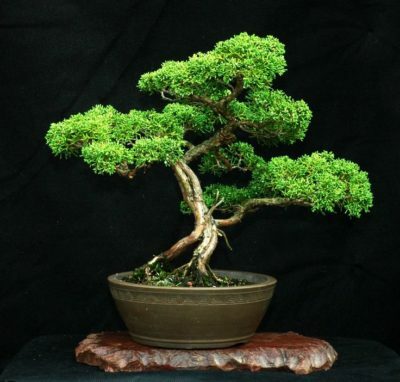 The Shimpaku Juniper is one of the highest regarded trees for bonsai in Japan, known for its dark green foliage and small needle size, flexibility and hardiness. I have set aside an excellent group of these trees recently acquired from my winter buying trips. Learning how to grow Shimpaku Juniper is an important starting point to refining, designing and caring for cold hardy out door bonsai. Don’t miss this opportunity. Trees will be wired and styled but not transplanted. In this exciting class we will be building multi-tree grove plantings to simulate the beauty of forests in the natural landscape. 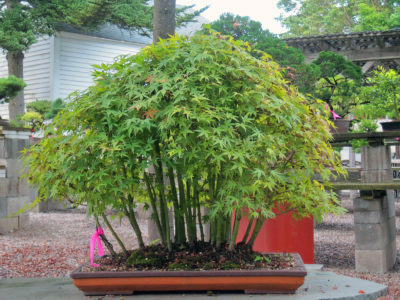 Students will work with our tremendous selection of young Japanese maples to build groves ranging from 3 to 17 trees in a beautiful pot. We will provide a selection of appropriate pots, and make recommendations about styling and shape, but students will have tremendous flexibility to create the grove they envision, and to explore the art as they see fit. Working with what is possibly the ideal deciduous tree, students in this class will focus on deliberate design and on styling a tree with the future in mind. The trees will be thoroughly analyzed, pruned into a classic informal upright style, and potted to ensure both a healthy tree, and a beautiful one. With their exfoliating bark, tiny leaves, and powerful robust growth habit, no bonsai collection is complete without a Chinese Elm. Come prepared with a challenging project. Students should talk with Michael about detailed goals and restyling projects before class so during the workshop we could maximize productivity. 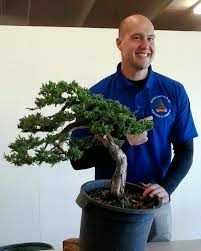 I am happy to work on any species of trees however my specialty is Juniper and Pine. Give me a call and set up a consultation. Looking forward to working with you. This class is ongoing. Email (info@bonsaiwest.com) or call us (978-486-3556) to set up a date and time.